Charizard – Beckett BGS 10! No surprises at #1. Pretty sure every single one of you guys knew this was going to be here. The only surprise to some of you might be the value of a Beckett “Pristine 10” Charizard. Most people believe it’s more difficult to achieve a Beckett Pristine Grade vs a PSA “Gem-Mint 10” grade. Therefore Beckett 10’s can sometimes sell for more than their PSA 10 counterparts. Charizard here is a perfect example of that. 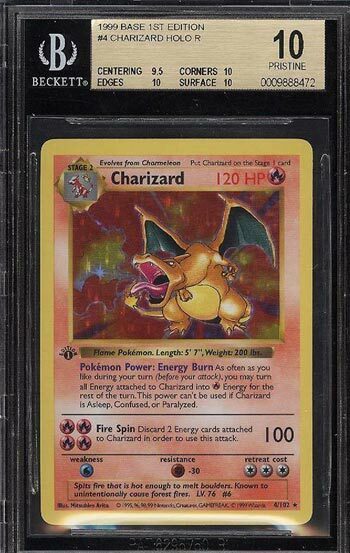 This Pristine 10 Charizard sold for $55,000 in 2017. In the last 3 months, we’ve seen four PSA 10 Charizards sell for an average of $20,000. There are currently 115 1st Ed., PSA-10 Charizards in circulation. I believe there are only 2 Beckett Pristine 10’s. But don’t let this fool you. Pokemon collectors submit ways more cards to PSA for grading. I think Magic: the Gathering players prefer Beckett, while Pokemon players prefer PSA. A total of 181 1st Edition Charizards were submitted to Beckett for grading, while 1,599 1st Edition Charizards were sent to PSA. Regardless of where it’s sent, or where it’s graded. This is a phenomenal card in anyone’s collection. We hope you enjoyed the countdown! If you missed any of the cards, simply click back using the “Last Card” arrow below, and check out the rest of the Top 25 cards and honorable mentions.